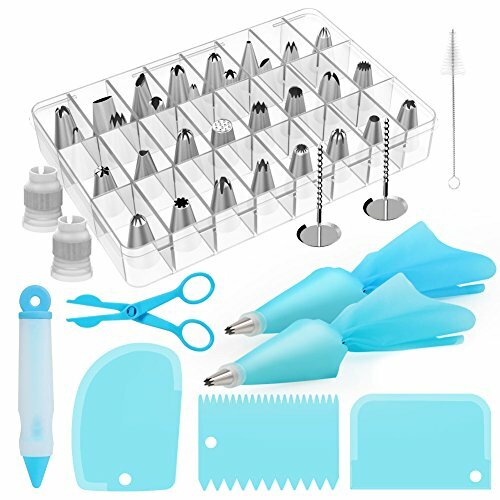 Kootek cake decorating kit includes icing nozzles, piping bags, icing smoother, coupler, flower nails, decorating pen, flower lifter- everything you need to create beatiful cakes. Round, grass (Grass tip is special size, directly use with piping bags), open star, drop flower, leaf, rose, french, basketweave, petal, plain and closed star. This is ideal for both beginners and professional users. Use this decorating kit for baking cakes decorated to mark to special celebration(birthday or wedding). Or can also mark national holidays.